10 Restyling & tRuck AccessoRies | March 2015 restylingmag.com Key audio brands promoted at Cooper Tint and Electronics include Alpine, Ken- wood, WetSounds, Focal and JL Audio. While car stereos may be on a slight down- trend due to the high-quality OEM sys- tems, Chaffin says that dashboard cameras with DVRs is a segment that seems to be expanding. "It's all about knowing the market and what your customers are asking for," he says. "We are constantly getting people who are shopping online, so you've got to be on your toes as far as knowing what the customer knows, be humble enough to listen while also confident that you can do the job with assur- ance that you can do good quality work." H i g H - t e c H s H o w r o o m Chaffin and his sister Jill Splitt in 2013 made the decision to consolidate their business into a brand-new, state-of-the-art "super center" in order to remain relevant within a changing market. e 5,000-square-foot building dedicates 1,000 square feet to a high-tech showroom with a 25-foot-high ceiling that showcases the company's key product categories, including window tinting , speakers and audio systems for automotive and marine applications; along with five large flat-panel monitors to show vendor messages, music videos, car club slide shows and promotions. ere's even a window into the 4,000-square-foot service and installation bays that accommodate eight cars at a time. "Our goal in designing this building was to enhance the customer experience," Splitt says. "We wanted to create a fun atmosphere with a high-tech environment and we added showroom windows that look directly into it so customers can see the cars that are being worked on. An added benefit is that it keeps the installers motived to do a good job because they know that they are being watched by customers." 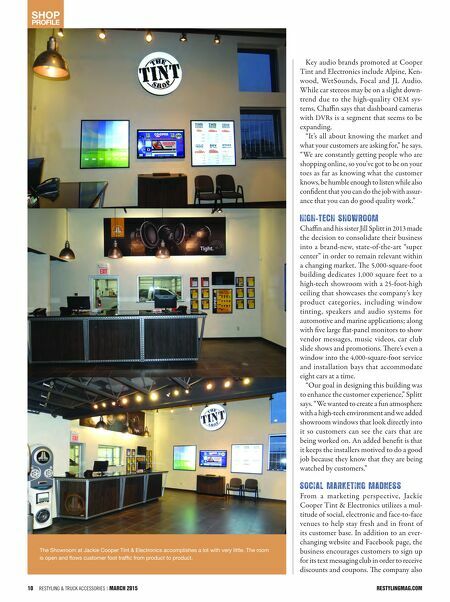 s o c i a l m a r k e t i n g m a d n e s s From a marketing perspective, Jackie Cooper Tint & Electronics utilizes a mul- titude of social, electronic and face-to-face venues to help stay fresh and in front of its customer base. In addition to an ever- changing website and Facebook page, the business encourages customers to sign up for its text messaging club in order to receive discounts and coupons. e company also Shop profile The Showroom at Jackie Cooper Tint & Electronics accomplishes a lot with very little. The room is open and flows customer foot traffic from product to product.